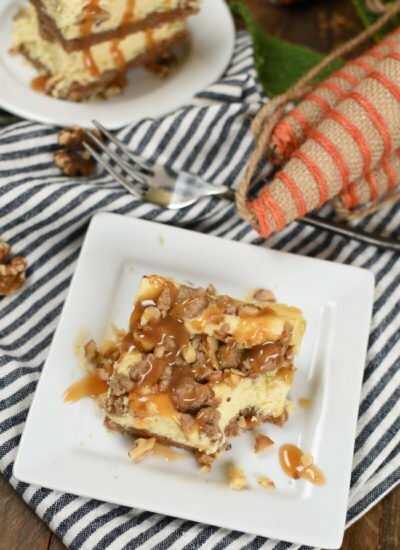 If there is one dessert you make this fall, it has to be Caramel Apple Crisp Magic Cookie Bars! They have the most incredible oatmeal crust which will remind you of apple crisp! They have all the traditional magic bar toppings; decadent chocolate chips, caramel bits, apple pieces, and of course coconut! 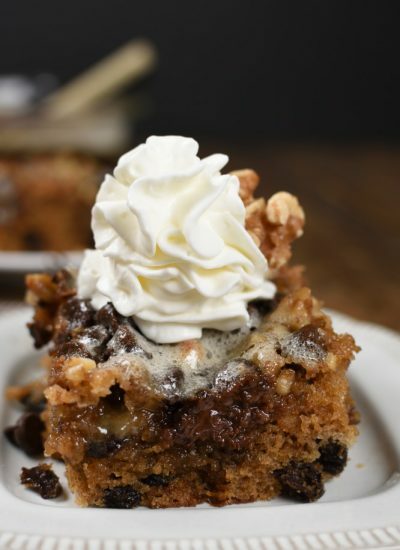 Drizzle the whole thing with sweetened condensed milk and you’ll end up with a gooey and truly magical dessert bar! Have you evern been to one of those goumet candy shops that sells caramel apples? Do you stand there staring at the amazing options for fancying up a caramel apple? There are so many steller choices! 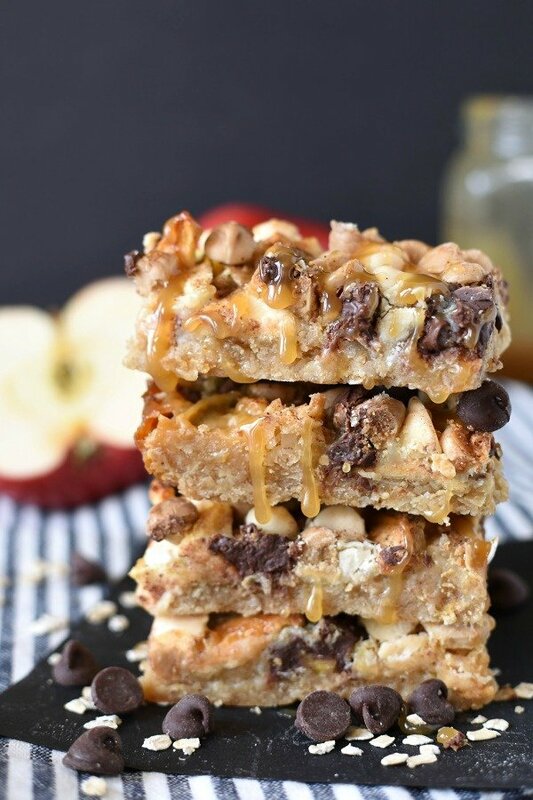 I’m hear to tell you those fancy pants caramel apples don’t have anything on these dessert bars! These have caramel and apples, plus all the fun extras; chocolate chips, white chocolate chips, caramel bits, and coconut! 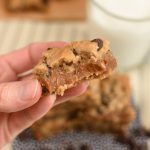 The toppings create the most decadent gooey cookie bar ever! Let’s talk about the crust for a minute though! It’s made with oats and resembles an warm, spicy apple crisp! It’s seals the deal on these cookies and I’m in love with it! Magic cookie bars are often refered to as Magic Bars, 7 Layer Bars, 5 Layer Bars, or Hello Dolly Bars. They are all basically a variation of the same dessert. These dessert bars have several layers, typically beginning with a graham cracker crumb crust. That’s followed by chocolate chips, butterscotch chips, coconut, chopped pecans, or other toppings of your choice. The final layer is decadent and amazing! Pour a can of sweetened condensed milk over the whole pan and it creates a gooey caramel layer! The cookies are baked, then cooled, and cut into squares. 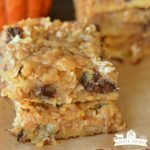 Be sure to check out my Pumpkin Magic Bars! My mom used to make Magic Bars when I was little and truth be told, I never really liked them! Sorry mom! I’ve finally figured out why. First of all, I don’t really like graham crackers, unless I’m making smore’s. Second, the recipe she used said to pour sweetened condensed milk over the graham cracker crust, then top with all the goodies. Here’s what I’ve learned. 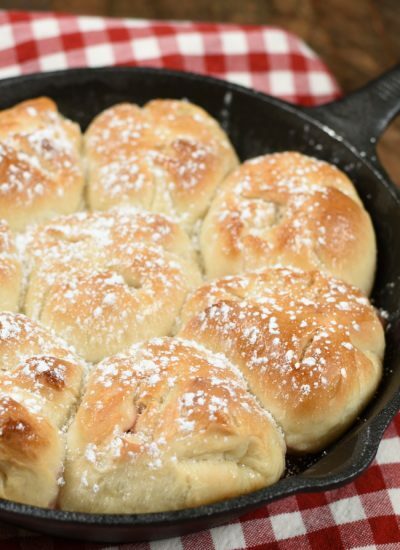 Experiment and get creative with crust options! Think crushed Oreo’s, Vanilla Wafers, peanut butter sandwich cookies, or in this case I used an oatmeal crust. Regardless of what crust you settle on, bake it for 5 minutes before adding all the toppings. This helps the crust to set a little bit and keeps all the sweetened condensed milk from making the crust soggy. Pour sweetned condensed milk over all those goodies (once again get creative). It makes everything extra gooey! Line the baking pan with aluminum foil, then spray with nonstick baking spray. What kind of apples can I use for baking this dessert? 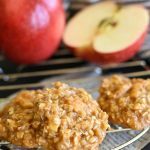 My favorite kind of apples to use in these cookie is dehydrated apples! They are my favorite for a couple reasons. I always have them on hand, and they don’t add extra moisture to the cookies. The dried apples I used were straight from my food storage and where crispy. They softened right up as they baked and ended up working perfectly! Other types of apples can be used too. Peel, core, and dice them. Check out my Simple Puff Pastry Apple Tart for a list of my favorite baking apples! 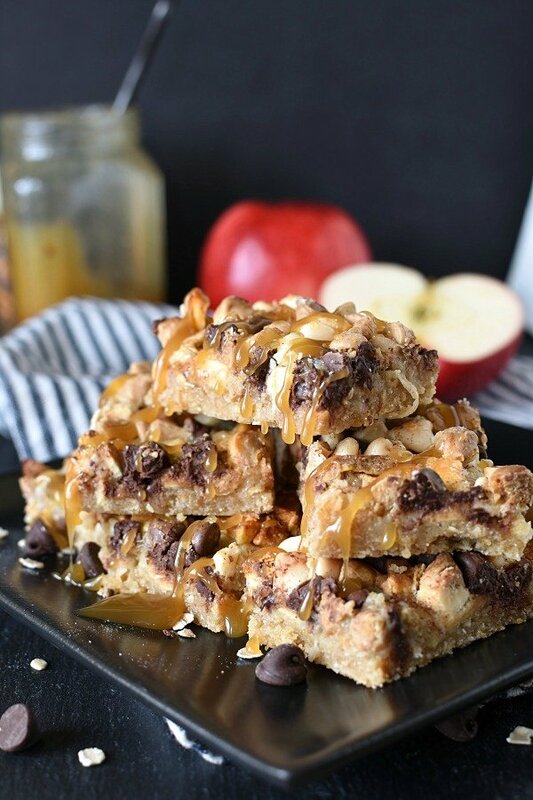 Here’s a list of caramel apple recipes I think you’ll like! My kids are out of school on a two week “potato harvest” break! I love having them home and will take a break from school every chance I get! Although we don’t have potatoes to harvest we have plenty of other work to finish up before the winter sets in. The boys have been building a new feed bunk for some of our cows. That means they’ve been pouring about four loads of concrete every day! The boys have to set up forms for pouring the concrete in, wet the ground so the dry dirt doesn’t leech all the moisture out of the wet concrete too fast, rake, tamp, and float the concrete. The other day I took lunch to the crew and got roped into helping finish the concrete. 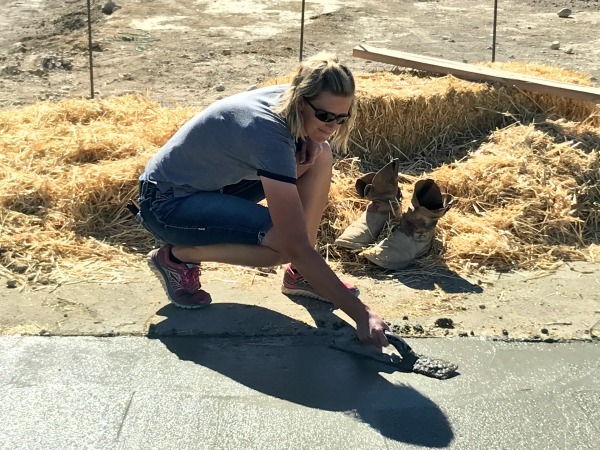 Before my kids were big enough to really help it was my job to finish all the concrete. It’s really similar to frosting a cake! What can I say…food is always on my mind! 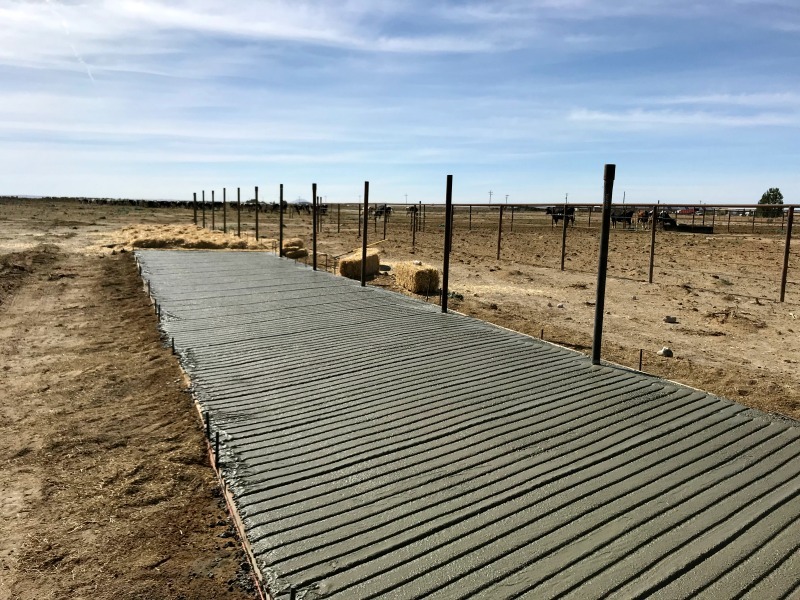 Once the project is finished we will be able to feed about 400 cows in that manger space! I can’t wait until we have this job crossed off of our to do list because it’s consuming all our time, and it’s expensive! 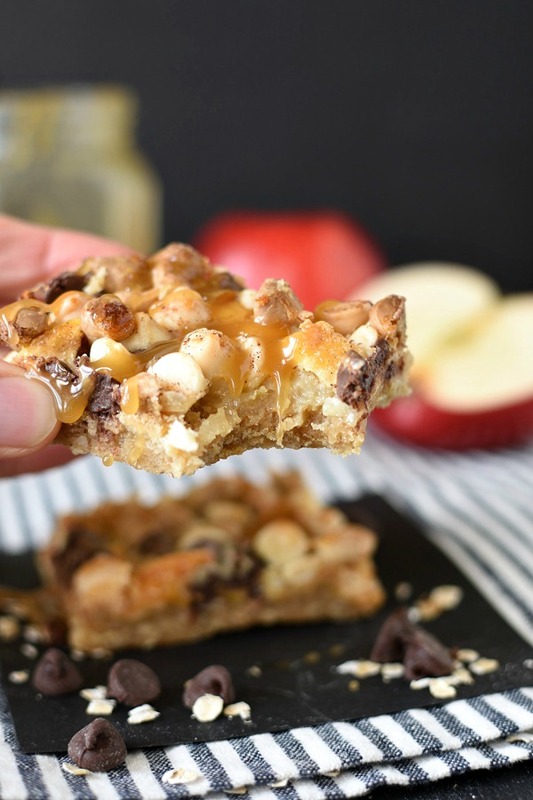 Grab the Caramel Apple Crisp Magic Cookie Bars recipe here! As a food blogger I’m constantly creating and experimenting with new recipes. Some some need tweaking, some become regulars, and some are out of this world scrumptious! 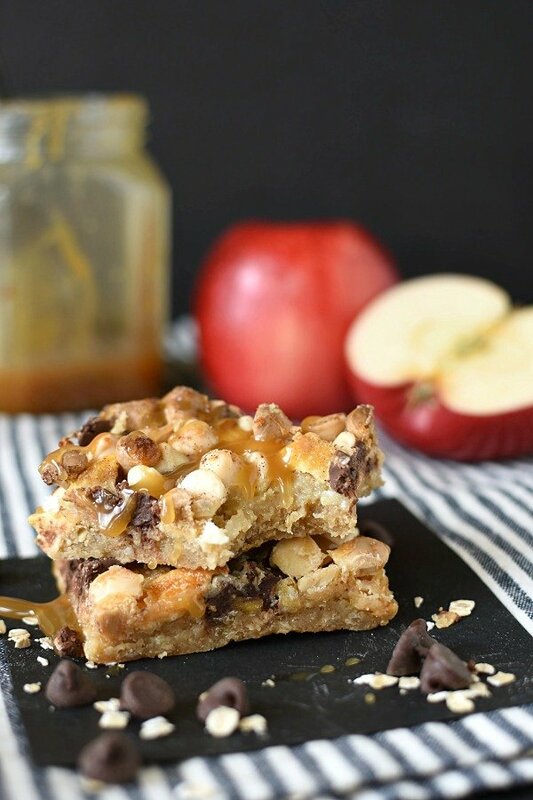 These caramel apple dessert bars fit in the out of this world category! Seriously, I can’t stop eating them and had a hard time sharing them with Payson’s football coaches because they are so darn yummy! 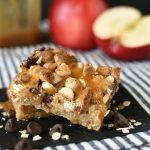 Caramel Apple Crisp Magic Cookie Bars have the most incredible oatmeal crust that reminds me of amazing apple crispy topping! 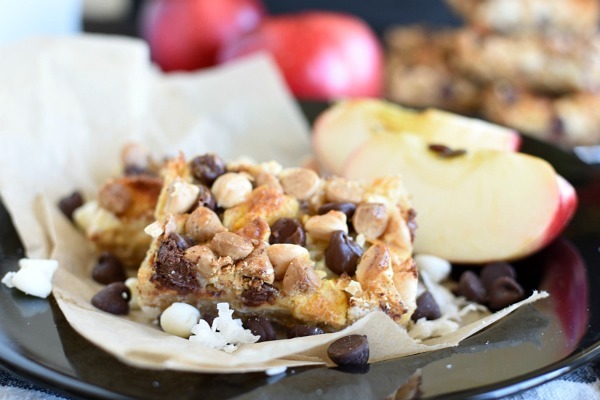 Little pieces of sweet apples, chocolate chips, and coconut perfectly balance out all that caramel giving them a favorite fall twist on traditional magic cookie bars! Caramel Apple Crisp Magic Cookie Bars have the most incredible oatmeal crust that reminds me of that amazing topping apple crisp! 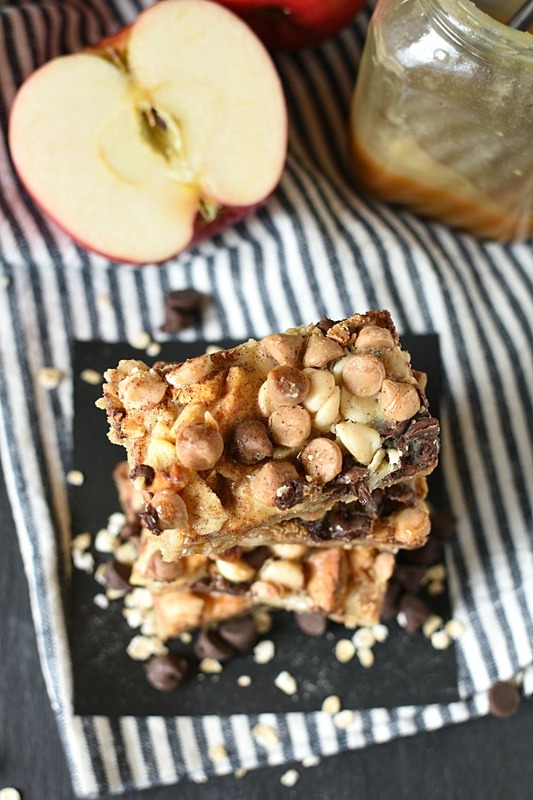 Little pieces of sweet apples, chocolate chips, and coconut perfectly balance out all that caramel making them a fall favorite twist on traditional magic cookie bars! Preheat oven to 350 degrees. Line 9" x 13" baking pan with aluminum foil, then spray with nonstick baking spray. Set aside. Cut butter into 8 pieces. 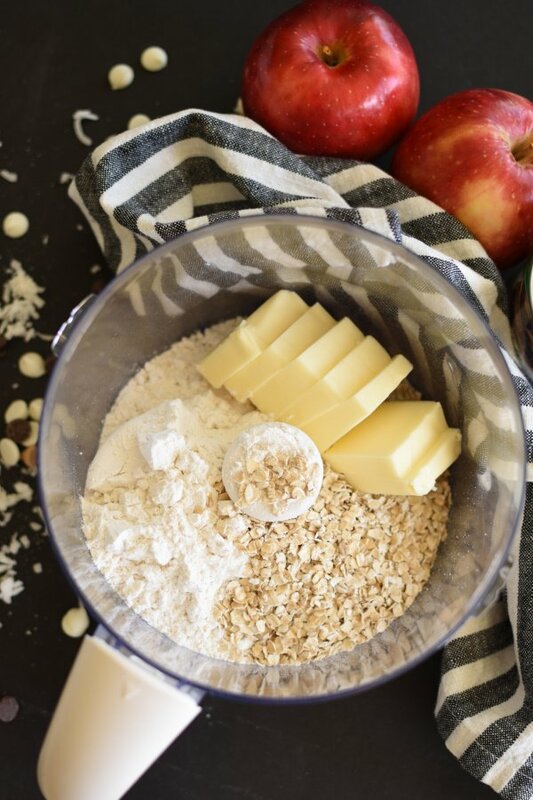 Add butter, flour, and brown sugar to food processor. Pulse until it resembles course crumbs. Add oats and pulse to combine. Press oat crumb mixture into the bottom of prepared baking pan. Bake for 5 minutes. Sprinkle chopped apples, white and semi-sweet chocolate chips, coconut, and walnuts over the top of baked crust. 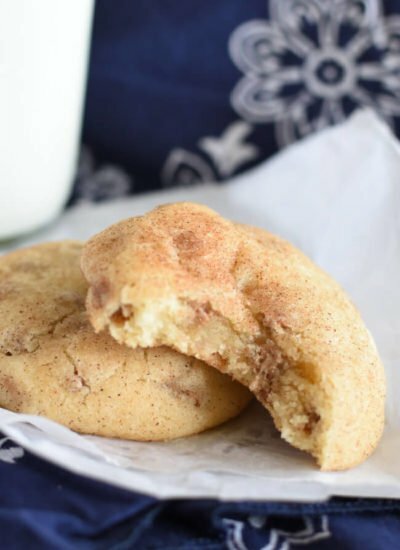 Mix sweetened condensed milk and apple pie spice together. Drizzle it evenly over the baking pan. Don't worry about stirring or spreading it. Bake for 25-30 minutes. Watch it close and don't over bake or it will be dry. Cool. Cut into squares. Serve. Fresh apples may be used instead of dehydrated apples. Peel, core, and dice apples before adding them to the dessert bars! 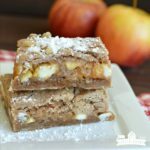 Here are some other apple recipes you’ll like! Loving all the tips and tricks to getting this right! These look fantastic! Not all magic bars are the same! They have to be oh so gooey to be out of this world! Enjoy! Wow looks awesome! Seriously these are mouth watering, can’t wait to try this! They are the BEST fall treat ever! They are a much easier way to enjoy caramel apples than making traditional caramel apples! Wow, how amazing does that look! I’m sure this is incredibly delicious! Now, this recipe will be one of my favorites. You just can’t go wrong with caramel and apples! I can’t wait for these to join your list of favorites! 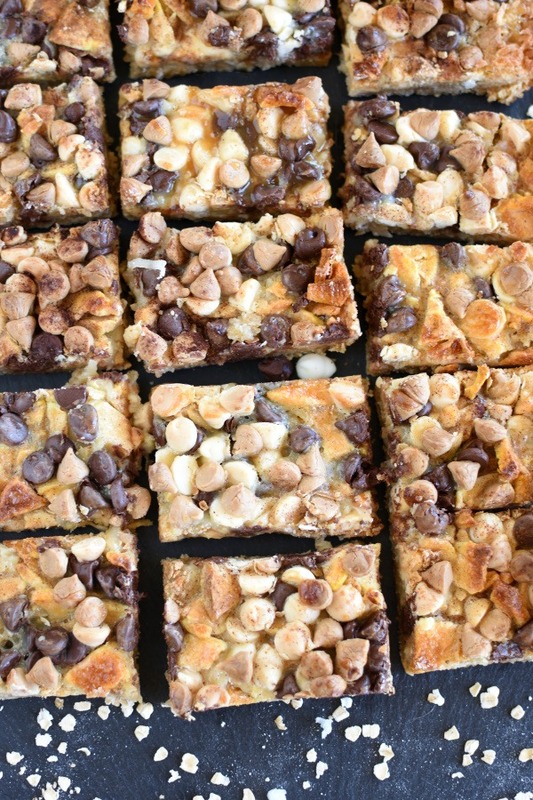 These cookie bars have all the ingredients I love. I need to make them for my kid’s lunch box. My kids were thrilled to come home to these cookies! I can’t wait for your kids to try them! These look irresistible! I can’t wait to take a bite of them! They are irresistible! I couldn’t stay out of them! Oooh, these look heavenly! These look so fun and tasty! Thank you! It’s one of my favorite new twists on caramel apples! So yummy and easy! These look AMAZING!!! I want to crawl through my computer and eat one! I wish you could crawl through your computer and come hang out for awhile! We’d definitely eat these cookies while we chatted!